!!!! LOCATION !!! LOCATION !!! LOCATION !!!! Come stay and play at the best NEW !!! NEW !!! CONDO in 2018, JUST UPDATED WITH NEW NEW CABINETS DECOR, NEW KITCHEN SINK AND FAUCET, NEW CARPET IN ALL 3 BEDROOMS, NEW MATTRESSES AND BEDDING COVERS AND PILLOWS, NEW GRANITE IN 2ND MASTER SUITE AND NEW PAINT IN ENTIRE CONDO And Patio. New 65 in smart TV with Netflix and all the latest apps. All bedrooms have up graded TV's. Updated Decor and Art work. THE TOWERS AT PARKVIEW BAY Is the ONLY High Rise At the the Lake. Breathtaking Park Lake View. Upscale New three-bedroom, two-bath condominium with 1775 square feet with covered deck, modern décor, that has everything you need for a great vacation experience. WALK IN UNIT with no steps or elevators this is a MAJOR factor to consider when choosing your vacation rental property! The master bedroom has a King size bed with a Lake view and a jacuzzi tub, separate shower, cable TV with DVD, and closet. There are Two Queen-size bedrooms also with TV's and dvd's. The deck is screened in with 2 ceiling fans, overlooking the state park and is 300 square feet. There is a large gas grill on the deck with 2 patio furniture sets The upgraded kitchen is fully stocked with everything you would need to prepare your meals or entertain family & friends. There is a glass mirrored wet bar to prepare your favorite drinks. A 14X30 boat slip is for rent for just $20 per night and right in front of the condo. The party cove is just two miles on the water from the condo so you save a lot on gas. Boating, jet skiing, sunning, swimming, and fishing on the lake. Two pools on complex an outdoor pool thats heated and heated indoor pool. Osage factory outlet mall within one-half mile from condominium. Several of the Lakes top waterfront restaurants are within minutes of the condo via water or land. The outdoor pool has a waterfall and is located on the water with a great view, including breathtaking sunsets. There is an indoor pool with hot tub,dry heat sauna and weight room. This is the perfect property, you can have fun for a romantic getaway, or bring the kids and enjoy all the fabulous family amenities. Either way, this exclusive resort has what you have been looking for. Cable TV in living room and all bedrooms (DVD in master suite, 2nd bedroom suite and living room). Fantastic View From Your Covered Deck. This view is unmatched elsewhere on the lake. You can watch beautiful sunsets from your furnished deck with a big gas grill. All furniture and appliances are new. Ceiling fans throughout. Ironing board and iron, cooking utensils, linens, blankets, and pillows. Please, ABSOLUTELY no smoking. NO bachelor/bachelorette parties! Have a great vacation at the lake! SIDE BY SIDE Stainless steel refrigerator with ice and water on front of door. kitchen has upgraded stainless appliances with a smooth top electric range. Microwave built in. Dishwasher. All appliances are brand new. 50' BIG SCREEN TV in family room. 42' Flat screen with DVD in master bedroom The other 2 bedrooms have 32' TV's with DVD player. GREAT VIEW OF LAKE THAT IS SCREENED IN WITH 2 CEILING FANS. Well equipped condo and owners are very easy to work with. Indoor pool, hot tub and sauna are great to have in the winter. Thanks so much for the Great review . Hope to have you back soon. We really enjoyed our stay.The indoor pool and spa were nice.Great place for a winter break. THANKS FOR YOUR GREAT REVIEW. HOPE TO HAVE YOU BACK SOON. 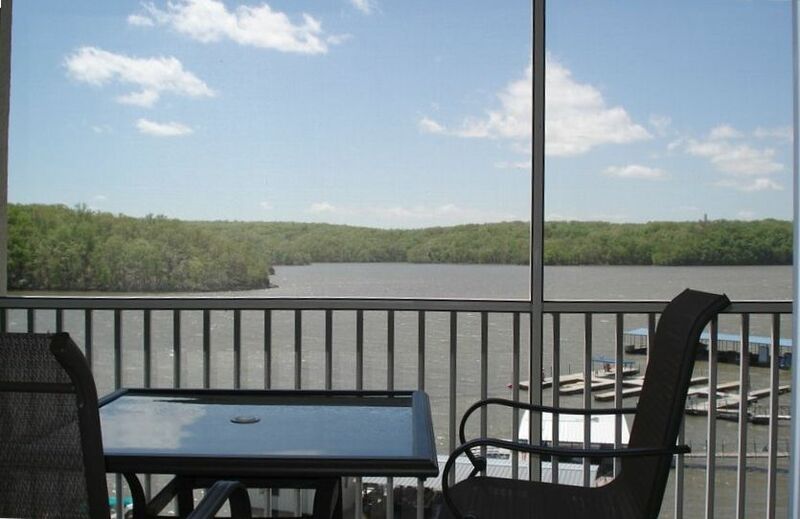 Wonderful condo, completly updated unit, great back screened in balcony and view of the lake! Larry, Thanks for your Great 5 STAR Review. Hope you come back soon. Thanks for sharing your beautiful condo with us. Great location and beautifully decorated. My husband loved the fishing and I loved the serenity of the location. Provided a peaceful refuge and was still so close to everything in town. We will definitely be back. Owners are great to deal with and provided timely communication. Debbie, Thanks for your Great 5 STAR Review. Hope you come back soon. The condo was very nice and in a great location! The owners are very responsive. Will recommend it to our friends. Loved the screened in balcony! Thanks for Great review. Hope to have back again. Great place - looks nice - very clean- easy to unload your car and groceries, BEAUTIFUL VIEW OF THE LAKE (especially at sunrise), quiet, had internet, the covered parking space is a nice touch- every thing in the unit is fresh - not worn looking like so many rentals are - will rent again next year!